Furniture: Gorgeous, five-piece, natural wicker set comprising three chairs, two in a darker shade, plus two tables. (Cane furniture like this was fantastically fashionable during the Victorian era). The seating comes complete with a multitude soft, handmade cushions, each one crafted from vintage fabrics – all are tasselled and/or trimmed, so please see the close-up photo of these. 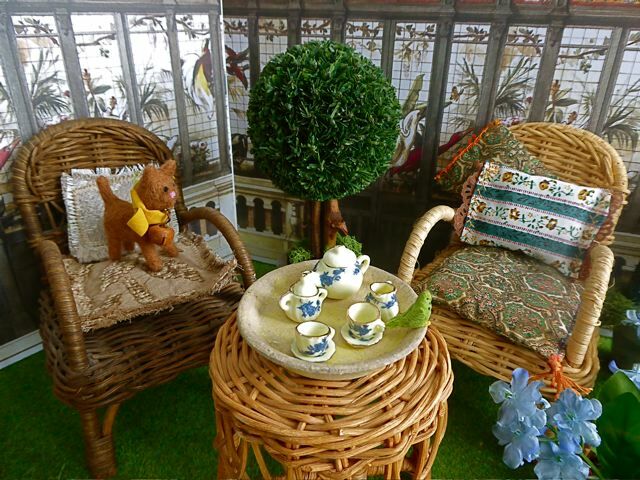 One table is set for tea with a china tea set on a ceramic tray – note the little parakeet which has alighted on the edge of the tray and attracted the attention of the little felt cat! The other lower table displays an old-fashioned birdcage (with a bird inside) and two terracotta flower pots holding fake flowers. Lawn Mower: A very realistic miniature, old-fashioned, metal lawn mower – a marvellous miniature. Topiary: Three large ceramic pots hold three shaped, topiary shrubs, each with a mossy edging. In addition, a small wicker basked holds some fake cut flowers - and there’s even some miniature scissors supplied with this room set. Background: An illustration of an Italian aviary (i.e. 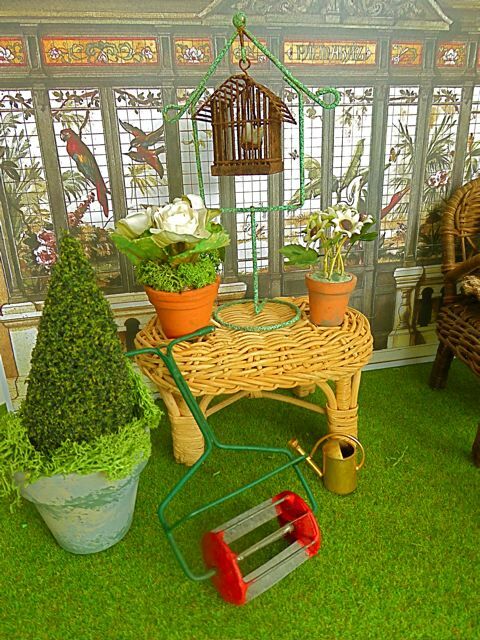 a conservatory for housing rare birds) forms the background of this set. It has been mounted on two pieces of A3 foam board. Each piece of foam board measures 42 x 29.5cm or 11 5/8 x 16 3/8 in. A piece of fake grass measuring 49.5 x33cm/ 19.5 x 13in is also included in the price below. 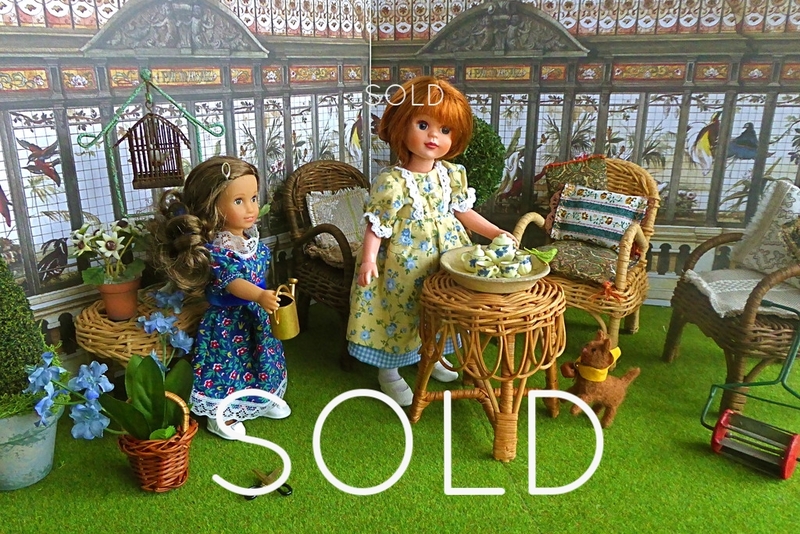 Dolls: All chosen from our selection of vintage dolls - please see the DOLLS section of our website for a larger choice. Shown here are a red-haired Kripplebush Kids doll and a mini American Girl doll, both dressed in Victorian-style clothing, available upon request. 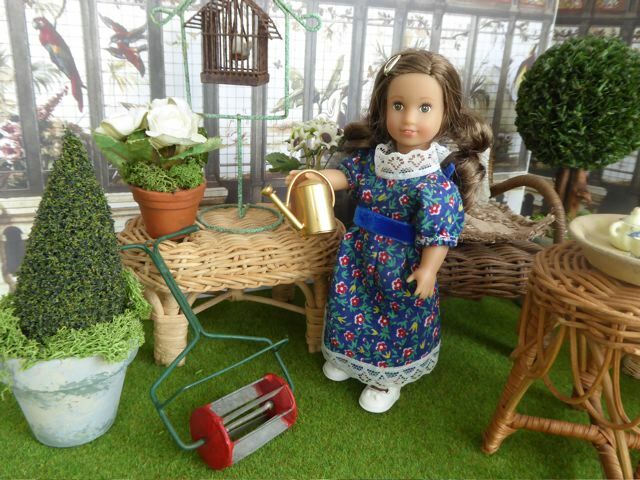 Please note that we always have lots of gorgeous vintage clothes for all 7”-10” dolls.